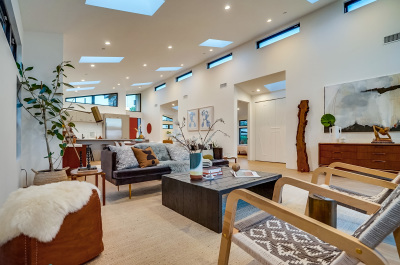 Urban Dweller's latest project, an elegant modern Mid Century, perfectly blends style and space in this 2001 sq ft Main House and 781 sq ft guesthouse/ADU, with a roof deck, in Eagle Rock's Dahlia Heights School district. Almost all new construction, the light-drenched main house (16 skylights) with high ceilings and white oak wood floors has 3 bedrooms, 2.5 baths, open floorplan with custom kitchen cabinetry, Bertazzoni appliances, custom made walnut vanities, stone accent walls, and a laundry room. The newly built guesthouse/Accessory Dwelling Unit has two bedrooms, kitchen, living and 1 full bath. It has its own address (5129 Mt Helena), gas and power meters. 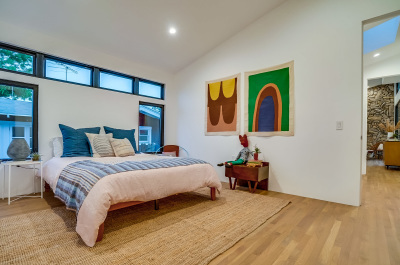 The bedroom walls can recede to create one large area. Ten foot ceilings, skylights and concrete floors make this unit ideal for the creative or home business owner. Wide driveway allows for side by side parking with additional room in the driveway ahead, behind the gate. 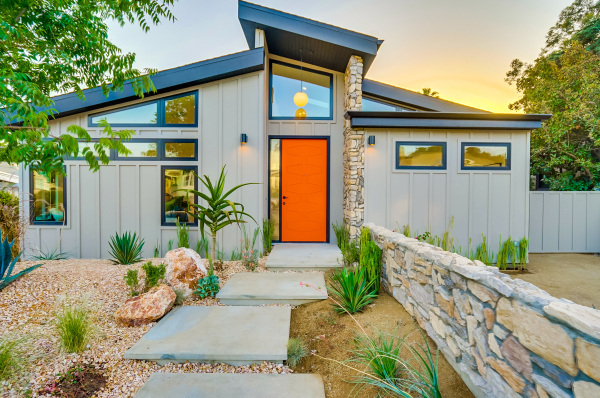 While the front yard has succulent and cacti plants, the large back yard has mature fruit trees, grape vine, raised vegetable beds, grassy lawn, and room for a pool, if desired. 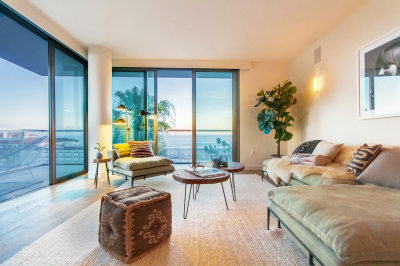 Urban coastal living and luxurious amenities come together at the highly sought after and prestigious The Seychelle on Santa Monica?s famed Ocean Avenue South. This corner unit offers total privacy in the most desired stack of floor plans in the building due to its layout that maximizes living space and privacy. White water views are seen from each window and balcony. This unit offers 2 bedrooms, 2.5 baths, den, impressive open kitchen/living/dining great room with wrap around balcony. Owners have invested $200K in additional upgrades. 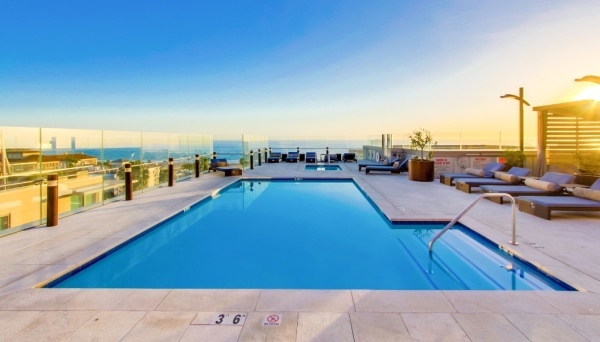 The stunning rooftop offers breathtaking views, heated salt-water pool, Jacuzzi, entertainment lounge w/full kitchen, bar, fireplace, cabanas and two outdoor bbq areas. 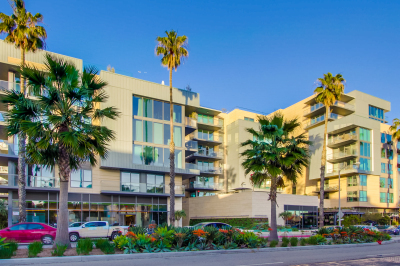 Other amenities include gym and yoga studio w/adjacent outdoor terrace, pet spa, business center w/conference room, 2 adjacent subterranean parking spots and more. Units at The Seychelle are currently reselling at 30-40+% above their initial sales in 2014/15. Built in 2014, The Seychelle is a LEED Certified building with beautifully designed interiors by world-renowned Clodagh Design Int'l.If spectacular views, luxurious building, total privacy, 24/7 concierge w/unparalleled amenities are on top of your must have list, then look no further.